Your best friend loves birds. It's also their birthday coming up. What do you get them? I find a bird pendant at the local craft store and make my best friend a keycahin. 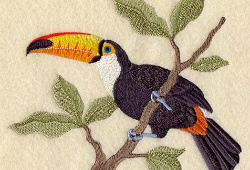 I plan on making my best friend a bird cage filled with life sized toucans, but I run out of time and get them a backpack with a bird print fabric. I buy my best friend a bird themed thing... maybe an actual bird! For my best friend's birthday, I make a bird cage filled with life sized toucans.